Well I promised to have some decor in the family room before the end of January! So here goes…this is my new ledge decor! I got some great tips and ideas from readers on Facebook and in the comments. 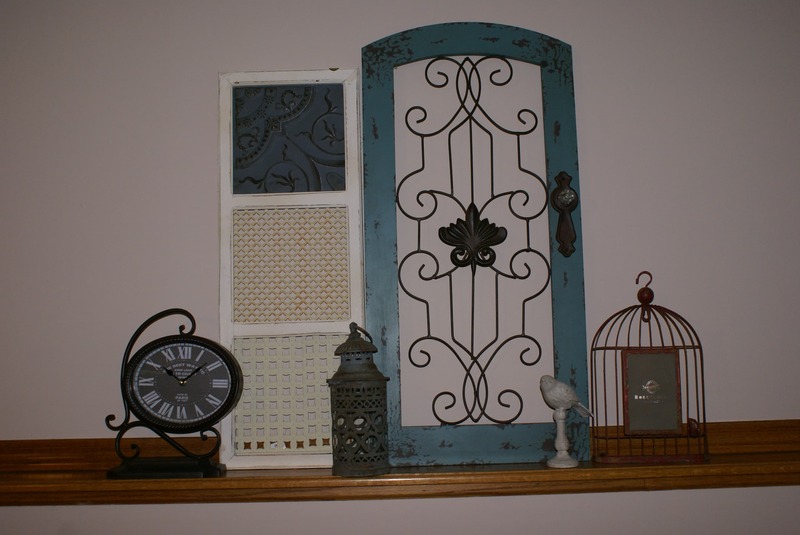 I did more research on Pinterest for decorating along a ledge. I also asked the advice of one of my cousins whose home is always decorated so cute! I was actually surprised how many ideas came up when I searched “ledge decor”. Who knew that so many people had ledges that they were struggling to decorate! I decided to use the ledge and do groupings. I thought that it might be better to not actually hang anything on that long wall…but to just lean the items against the wall along the ledge. This will allow me to change items out for different holidays or if I get sick of something! I went to some of my favorite stores to get ideas and buy stuff! I looked at Kirkland's and found a lot of items I liked, but didn't end up buying anything there. I bought several items at Gordmans and Hobby Lobby. 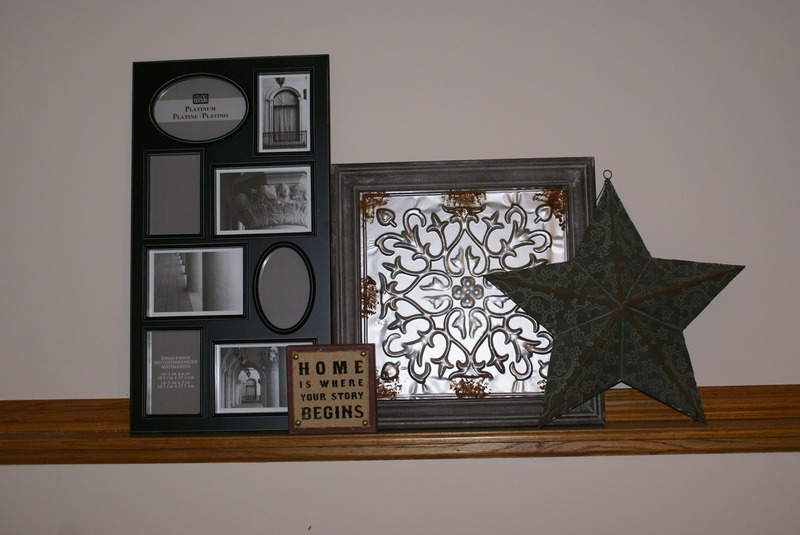 Some of the decor items I already had. 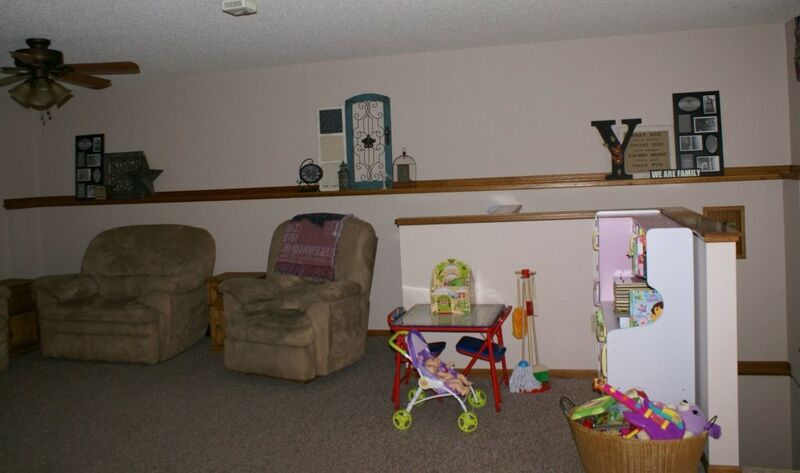 In the first post where I showed you the bare room I didn't take a picture of the whole room….so I wanted to show you how long that wall really is…there is a little nook area by the basement stairwell. This nook is used right now for my toddler's toys and it is her play area until she is big enough to play in the basement alone. I am pretty happy with how it ended up. 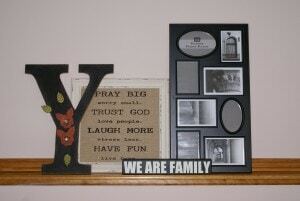 I love the items that I have and the way they are grouped. I tried to mix colors, textures and words. I still need to hang something on the other wall in this room…I have a big mirror that needs some work done to it. That is my next project…so be watching! Let me know what you think about my ledge decor! That is just beautiful! It’s looking great. I love redecorating rooms. I love playing with room decor. You’re off to a great start with the mixed heights! Lots of fun pieces for your decor – nice and personal! I love all of the combinations! I can’t wait to decorate our home when we get one! That is a darling idea! The decoration is nice and I love the color combination. You did a great job in decoration. All the best with the mirror decoration as well. 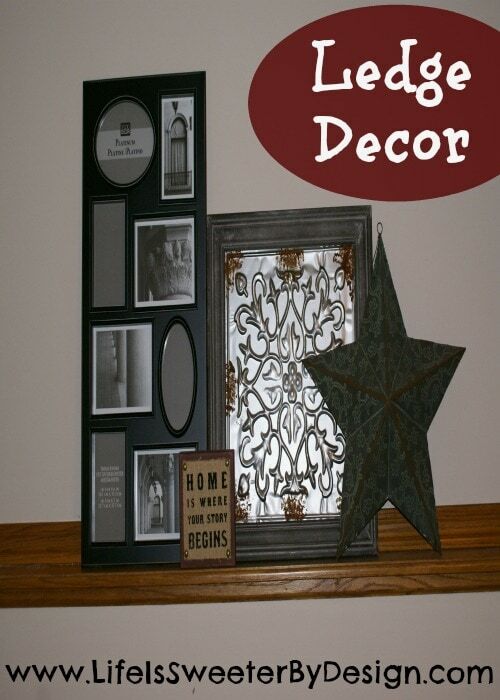 The addition of pictures in frames will bring these decorations to even more life. Nice to have such a lengthy ledge to decorate, I like the spacing as it adds to the room without causing clutter. Looks great. I can’t wait to get our new place so we can decorate. I love the idea of adding a ledge around the room! 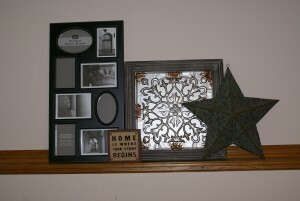 It can be so versatile for art without putting a million holes in the wall. And those items you decorated with are beautiful. My favorite is that aqua door piece.